The Green Sanctuary: What is Limau Purut, or Kaffir Lime ? What is Limau Purut, or Kaffir Lime ? 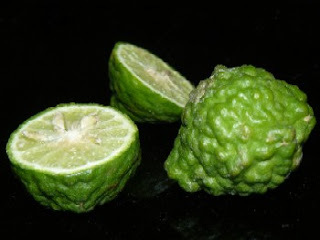 Limau purut, the Malay name for Kaffir Lime, or its scientific name Citrus hystrix of the Rutaceae family, is well known for its medicinal properties, not only by the Malays in the old days but also by modern scientific researchers. In Pahang (3rd Largest State in Malaysia), besides its usage in adding flavor to traditional Malay dishes and cuisines, like the rendang, and tomyam, it is sometimes used as herbal medicine to treat normal skin disorders. It is not actually used for treatment of chronic skin disorders like psoriasis or eczema, but only for ordinary skin irritations that normally require basic general medications. Limau purut contains tannin, triterpenouid and saponin. It is used in herbal medicines and traditional treatments, as the fruit and especially its leaves, have those special properties to encourage the growth of skin. 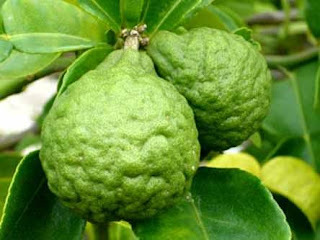 The Malays of Pahang, in the old days, used limau purut juice to treat hair and promote healthy growth of hair follicles. Nowadays to achieve this better, hair is first washed with ordinary shampoo, and then the hair and scalp are washed with the juice extracted from the fruit. The juice is then left for a few minutes on the head to let it soak into the hair follicles, and then the head and hair is rinsed finally with plain water. To alleviate colds, lack of energy and tiredness, the juice extracted from the fruit is mixed with plain water and drank three times a day. The juice actually tastes very sour and bitter, perhaps a lot more bitter than lemon juice. It is traditionally believed that it is good for blood circulation. The leaves are also utilised as one of the ingredients in traditional Malay sauna bath or "mandi wap" because of its fragrance, while the essence of the fruit is now popularly used in modern aromatherapy. 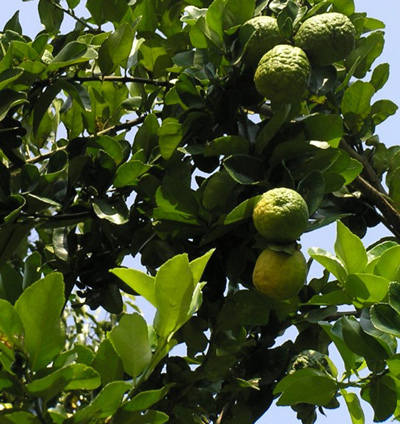 Why is Limau Purut used in Silat ? Limau purut also plays an important part in the rituals of some forms of the Malay art of self-defence, silat. It is normally used in the ritual of bathing after graduation where the limau purut fruit is cut and blended with plain water and then students are bathed as part of spiritual bathing by their Malay silat master. The reason it is used in silat is that it is said to have some special qualities, like invigorating the senses during self-defence training. Perhaps its fragrant and sharp odor contain elements that provide some peculiar and distinctive aromatherapic properties to the brain. Besides the silat rituals, limau purut is also used in the cleaning of keris, the deadly Malay weapon, and other iron or metal-based utensils. Besides being a good cleanser of rusts, the juice is also a great anti-rust agent. Cleaning the keris is done by swiping the keris with the half-cut fruit and ensuring its juices are spread on both sides of the keris. The keris is then finally cleaned and rinsed with plain water. Periodic cleaning of the keris will ensure its longevity by keeping rusts at bay. The leaves of this fruit are oblong or egg-shaped, and seemed to be a combination and linking of two leaves, like wings. The top side of the leaf is dark green and shiny, while the bottom side of the leaf is lighter or yellowish green in color. The leaf will give a fresh lime (or lemon-like) fragrance when squashed with the fingers. And in traditional Malay dishes, the leaves are added to give the dish the unique taste of lime. The flower of this fruit is star-shaped, and reddish white or yellowish in color. The fruit is smaller than an ordinary apple or orange, and round and pear-like in shape with uneven skin, having sort of big pimples or "mini-volcanoes" on the skin ! Ugly skin, not handsome or pretty at all, but, aww, it doesn't matter. It's what inside that counts, right ? Well, so much for now on the limau purut, the herbal plant with medicinal and health properties, and used by the Malays in Pahang for many purposes. It is generally used, as mentioned above, in some recipes of traditional Malay food and dishes, as a cleaning agent for metal parts, as herbal remedies for hair and skin disorders, and many more. 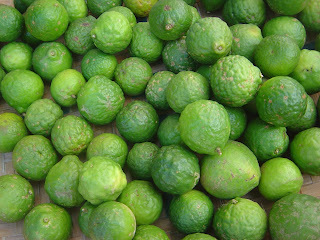 Limau purut or kaffir lime is a very useful fruit indeed and used quite extensively especially in the rural areas of Pahang. Do look out for it whenever you’re in Pahang (Malaysia).